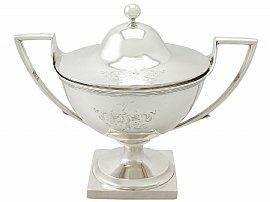 This fine antique George III English sterling silver tureen has a circular rounded form onto a pedestal with a circular spreading foot and plain square base. The plain body of this Georgian silver tureen is embellished with an impressive contemporary bright cut engraved helm and scrolling leaf decoration incorporating a crest of an arm embowed and cuffed holding an arrow. The upper rim of the tureen is encircled with an applied band of reed decoration. This antique tureen retains the original hallmarked push fit plain domed cover surmounted by the original hallmarked ball style finial. This tureen is fitted with two sterling silver angular loop handles. This Georgian silver tureen is a very good gauge of silver, excellent quality and in excellent presentation condition. The bright cut engraved decoration is sharp. Full hallmarks struck to the surface of the tureen and part hallmarks to the rim of the cover are all very clear; the maker’s marks show signs of wear in keeping with age and location, but remain legible.